I know how it is as a parent. 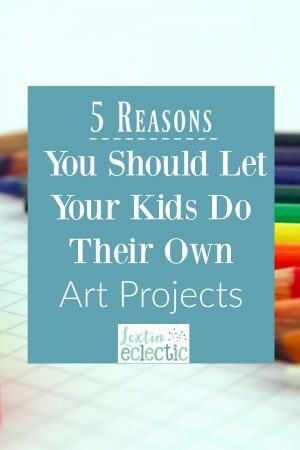 You watch your kids work on a craft or art project and you desperately want to help them because their project doesn’t look quite the way you envisioned it. Or maybe it’s not turning out at all like the Pinterest pictures. You want a pretty finished product and you are very tempted to give them lots of hands-on help. You want to step in and keep them from painting the cows purple and the sun black. You want to help them draw the house or the tree. But you need to resist that temptation! Don’t take over your child’s art project. Let them work independently. Art isn’t about the end result. It’s about the process. Let me tell you a story to show you exactly why it’s vitally important to let your kids create their own masterpieces without your help. The day dawned bright and early for our homeschool art day at the local art museum. I packed lunches, loaded my kids, and made the long drive downtown for a morning of art projects and a museum tour. The topic of the day was Oceanic art. We painted geometric shapes on bark paper with black paint. Then we took our tour of the museum (which is always interesting with two toddlers in tow). We explored the wing of the museum that contained art from the South Pacific islands. After our tour we went back to the studio where my kids were given baskets to weave into a hog, imitating the hog-shaped basket we had seen in the exhibit. I handed each child a basket, a pile of raffia, some feathers, and a few sea shells. Then I sat back and let them create. I helped tie raffia onto baskets or assisted when their raffia was stuck between the slats. Other than that, I let them make their own creations. I’m proud of the art my kids create. Even if the painting or drawing looks nothing like the original subject, I’m just happy they were able to explore art through painting or drawing. I believe it’s the experience rather than the finished product. I may be one of the few parents who believes this to be true however. As I glanced down our table, I watched my kids weave their unique baskets. But at the very end of the table was another mom in a bright green sweat shirt. Her son sat quietly next to her with his basket. He looked to be at least 10 years old. He seemed unsure about the basket weaving, so he sat with his pile of raffia and waited. After a few minutes his mom took over, grabbing his basket and a handful of raffia. Then she proceeded to start weaving the raffia through the slats. She made it halfway around her son’s little basket before she realized that she had not tied the end of the raffia onto the corner of the basket. She was weaving but had little progress to show for it. Then she looked over at Curly (my 9 year old daughter) who was seated next to her. Curly is apparently a weaving rock star because her basket was starting to have rows of colored raffia woven all through the slats. The woman held up the basket and asked Curly to help her. Curly took the basket, tied the raffia on the corners, and then demonstrated how to weave. The lady was still confused. She asked Curly to demonstrate two more times before she continued working on her son’s basket. The entire time this poor boy sat next to his mom while she completely took over his project, weaving colored raffia around and over the edges. He never touched the basket again. His mom made that basket her own project and did it for him. Now, maybe the boy didn’t want to weave a basket. If so, that’s fine. However, his mom didn’t even give him a chance to try. She didn’t take the time to teach him or to let him make the project his own. As a parent, it’s important to know when to step aside and let your child explore and create. When it comes to art, I give my kids lots of freedom to express their individuality. When it comes to art, the process is much more important than the finished product. Why? Art is one of the best ways for a child to let his or her creativity shine. In art, there are no limits to what they can imagine and create. Art allows the child to express individuality. Art allows a child to problem solve. During art time, I let my kids learn from their experiences. I don’t tell them what happens when you mix two colors or when you paint with watercolor on top of crayon drawings. Art allows the child to experience new techniques and media. I let my kids experiment with whatever supplies we have on hand and I encourage them to explore and try new things as they create. Art allows a child to feel successful. In art, there are no limits or incorrect ways to create. Every child can feel successful no matter the end result of their art time. While I do prefer my kids artwork to be an object that I can recognize or at least a finished product that I would be proud to display on the fridge, I’ve learned to step back and praise their unique artistic efforts. As much as possible, I try to let my kids experience art themselves with as little direction from me as possible. There is no “wrong” way to do art. So, that’s why I let my kids do their own art projects. When you are choosing art projects for your kids, try out new techniques. Stray away from the pre-planned crafts at times. Focus on the experience. Let them learn through trial and error. But most importantly, let them do their own art and always provide plenty of encouragement. If you’re wanting to add more art into your homeschool day, here’s a list of some of my favorite art products that I always keep on hand for my kids. I have a cabinet full of art supplies for whenever my kids want to create and experiment with art. If you have these supplies, you will have a well-stocked arts and crafts area!